A 30 percent chance of snow showers, mainly after 5am. Mostly cloudy, with a low around 22. West southwest wind around 15 mph. A 30 percent chance of snow showers. Some thunder is also possible. Partly sunny, with a high near 34. Breezy, with a southwest wind 15 to 25 mph. A 30 percent chance of snow showers, mainly before 7pm. Partly cloudy, with a low around 22. 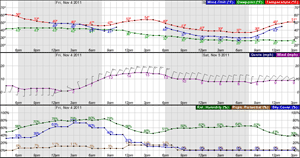 Breezy, with a west southwest wind 15 to 20 mph, with gusts as high as 35 mph. A 40 percent chance of snow showers, mainly after noon. Some thunder is also possible. Mostly sunny, with a high near 34. Breezy, with a south wind 15 to 20 mph, with gusts as high as 30 mph. A 50 percent chance of snow showers. Some thunder is also possible. Mostly cloudy, with a low around 21. South southwest wind 10 to 15 mph becoming east northeast after midnight. Snow showers. The snow could be heavy at times. Some thunder is also possible. High near 32. Chance of precipitation is 80%. Snow showers likely, mainly before midnight. Some thunder is also possible. Mostly cloudy, with a low around 22. Chance of precipitation is 70%. A slight chance of snow showers. Some thunder is also possible. Mostly sunny, with a high near 40. A slight chance of snow showers before midnight. Mostly clear, with a low around 27. A chance of snow showers. Some thunder is also possible. Partly sunny, with a high near 42. A chance of snow showers. Partly cloudy, with a low around 29. A chance of snow showers. Partly sunny, with a high near 42. A chance of snow showers. Mostly cloudy, with a low around 28. A chance of snow showers. Partly sunny, with a high near 40.